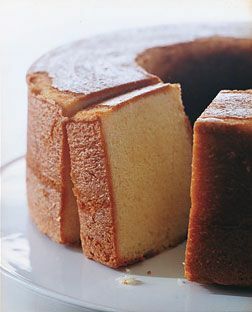 This is one of the best pound cakes I have ever tasted. Its tender appeal is owed in part to cake flour and cream, and in part to beating the batter an extra 5 minutes. Reduce speed to low and add half of flour, then all of cream, then remaining flour, mixing well after each addition. Scrape down side of bowl, then beat at medium-high speed 5 minutes. Batter will become creamier and satiny. Spoon batter into pan and rap pan against work surface once or twice to eliminate air bubbles. Place pan in (cold) oven and turn oven temperature to 350°F. Bake until golden and a wooden pick or skewer inserted in middle of cake comes out with a few crumbs adhering, 1 to 1 1/4 hours. Cool cake in pan on a rack 30 minutes. Run a thin knife around inner and outer edges of cake, then invert rack over pan and invert cake onto rack to cool completely.